Born in Rome, Cecilia was an early Christian of extreme courage. When her rich family arranged a marriage for her, she “sang only to God in her heart” during the wedding. That night, she explained to her husband, Valerian, that she belonged to God and couldn't be his. Her plea was so sincere that Valerian was converted and Cecilia's guardian angel appeared and crowned them both with white roses. Valerian’s brother, Tiburtius, also converted and the brothers were martyred for their new faith. Cecilia was arrested for burying their bodies, yet she converted those sent to force her to worship false gods. She even survived her execution – twice! She outlasted her sentenced suffocation in her own vapor bath, and the executioner sent to behead her only mortally wounded her, so she laid bleeding on the bath floor for 3 days. Before she finally died, she positioned her hands to symbolize her faith in the Holy Trinity. Although Cecilia is one of the most famous of the Roman martyrs, the familiar stories about her are apparently not founded on authentic material. There is no trace of honor being paid her in early times. A fragmentary inscription of the late fourth century refers to a church named after her, and her feast was celebrated at least in 545. According to legend, Cecilia was a young Christian of high rank betrothed to a Roman named Valerian. Through her influence, Valerian was converted, and was martyred along with his brother. 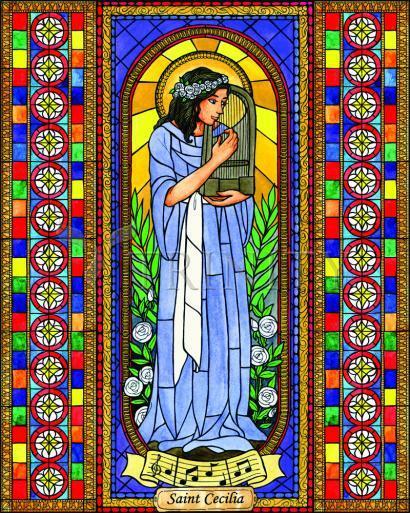 The legend about Cecilia’s death says that after being struck three times on the neck with a sword, she lived for three days, and asked the pope to convert her home into a church. Since the time of the Renaissance she has usually been portrayed with a viola or a small organ. Like any good Christian, Cecilia sang in her heart, and sometimes with her voice. She has become a symbol of the Church’s conviction that good music is an integral part of the liturgy, of greater value to the Church than any other art.